Considered to be one of the “holiest” shrines in Hinduism and, located at an altitude of 3,888 meters above sea level is a shrine called “Amarnath Cave”. This cave is located in Jammu and Kashmir at a distance of 141 km from Srinagar. It attracts thousands of devotees every year during the months of July to August for an annual pilgrimage known as “Amarnath Yatra”. Important travel information related to this “sacred” Hindu shrine is as follows. The ideal time to visit this holy site is in between July and August not only because of the pleasant climate but also due to the fact that it is during this period that the famous “Amarnath Yatra” occurs. b. How to reach Amarnath Cave? The Jammu Railway Station lies in close proximity to Amarnath. This railway station is well connected to most of the major cities in the country. Taxi services to Pahalgam (i.e. closest town to Amarnath) are available from this station. There are a number bus services in and around the state that are well connected to Pahalgam. The nearest airport to Amarnath is located in Srinagar. The Srinagar airport is well connected to major cities and towns in the country. According to a popular Hindu folklore this is the cave where Lord Shiva explained to his wife Parvati the secret behind “life and eternity”. In this cave during the winter months a stalagmite is formed due to the freezing of water droplets. This stalagmite is considered by Hindus as a “Shiva Lingam”. 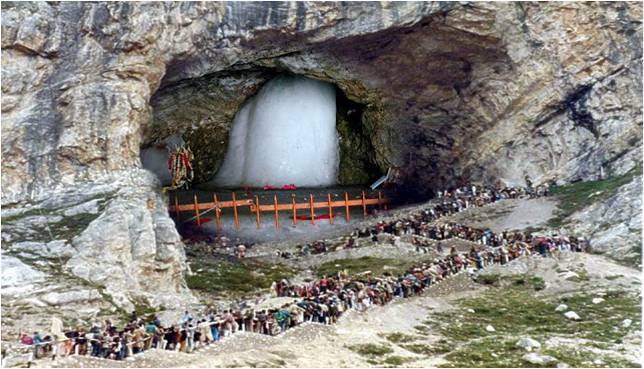 During the “Amarnath Yatra” it is this “stalagmite Shiva lingam” that pilgrims around the country worship.